Pendios offers Indian customers the Neural Networks & Artificial Intelligence technologies in terms of Neuro SolutionsTM product of Neuro Dimension Inc.
Neural Networks and Genetic Algorithms are exciting technologies in the field of artificial intelligence. These technologies have steadily changed the way we solve "real-world" problems in science, engineering and economics. NeuroDimension has brought state-of-the-art neural network and artificial intelligence (AI) technologies to the marketplace for over 10 years. NeuroDimension has customers in more than 60 countries around the world benefiting first-hand from its extensive expertise in the field. These neural network software products are among the most powerful and flexible on the market today, yet their intuitive graphical user interfaces make them incredibly easy to use. Download an evaluation copy of NeuroSolutions or TradingSolutions today and find out why they are the neural network tools of choice among beginners and experts alike. 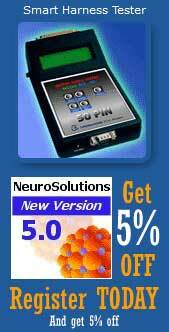 NeuroSolutions is NeuroDimension's base product. This leading edge software combines a modular, icon-based network design interface with an implementation of advanced learning procedures, such as recurrent backpropagation and backpropagation through time. Some other notable features include C++ source code generation, customized components through DLLs, a comprehensive macro language, and Visual Basic accessibility through OLE Automation. NeuroSolutions for Excel is a Microsoft Excel add-in to supplement NeuroSolutions. You simply highlight portions of your data as training, cross validation, or testing within your Excel spreadsheet, step through a few configuration panels, and you have a working neural network. Configure another panel and watch Excel graph the results from a batch of experiments. This powerful feature allows you to easily determine the optimum network parameters. The Custom Solution Wizard is a revolutionary program that takes a neural network created with NeuroSolutions and automatically generates and compiles a Dynamic Link Library (DLL), which can then be embedded into your own Visual Basic, Microsoft Excel, Microsoft Access, or Visual C++ application. The NeuroSolutions for MATLAB neural network toolbox is a valuable addition to MATLAB's technical computing capabilities allowing users to leverage the power of NeuroSolutions inside MATLAB. The toolbox features 15 neural models, 5 learning algorithms and a host of useful utilities integrated in an easy-to-use interface, which requires next to no knowledge of neural networks to begin using the product.